A little something with the feminine gEarhead touch. For girly gEarheads and their rides! Danica Patrick is probably the most widely recognized woman out of all the famous female drivers, and for a multitude of reasons. She is not only a successful auto racing driver, but she is also a model, an advertising spokeswoman, and successful gEarhead. To this day, Danica remains the most successful woman in the history of American open-wheel racing, she competes both in the NASCAR Nationwide Series and in the NASCAR Sprint Cup Series, and in 2013 she became the first female NASCAR driver to win a NASCAR Sprint Cup Series pole according to the Encyclopedia Britannica. Danica was also named Rookie of the Year for both the 2005 Indianapolis 500 and the 2005 IndyCar Series seasons . What started as go-karting at the age of 10 gave way six years later to racing in British national series events with Formula One world champion Jenson Button. She later earned a second-place finish in Britain’s Formula Ford Festival, which proved to be the highest finish by an American in the event. While Danica’s chief NASCAR sponsor, GoDaddy, has reportedly stopped sponsoring the sport this year to pursue other ventures, there is no doubt in our mind that the 33-year-old is going to find a way to keep racing and turning heads regardless of what sponsor chooses to keep her in the public eye. And by the way, does anybody remember what famous radio and tv personality has a MAXWELL? Hint: He played a violin off key and was notoriously stingy. The Big Girl has left the building! On Friday, Lani and Jon sold their 1970 Chevy Impala, to a very nice, Chevy knowledgeable man -- Benito -- in Oklahoma City. Benito, who has a 1939 Chevy, has been looking for a convertible Impala for his wonderful wife, who also loves classic cars, but wanted a convertible Impala for herself. Lani could think of no person more deserving of her super long ride. During her 20 years with Lani and Jon, the Big Girl has had a storied career. She was purchased by Lani and Jon in 1997 at a car museum at Petit Jean State Park, Arkansas. Lani and Jon went to buy a Barracuda, but immediately fell in love with the Impala instead. The Big Girl has been turning heads in Norman for 20 years. Her longest road trip was from Norman to College Station, Texas in July 1998, where Lani was speaking at an academic conference at Texas A&M University. 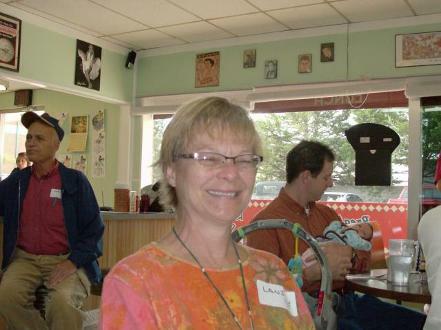 She has been in numerous Christmas, Norman High School, OU Homecoming, and Veterans' parades. She has ferried two newly married young couples, seated in their wedding regalia, on the parade sash, on their own personal Norman parades along Main Street. The drivers of Norman showed their joy for the newly married couples by waving, honking, and flashing their lights. To my knowledge, both couples are still married. 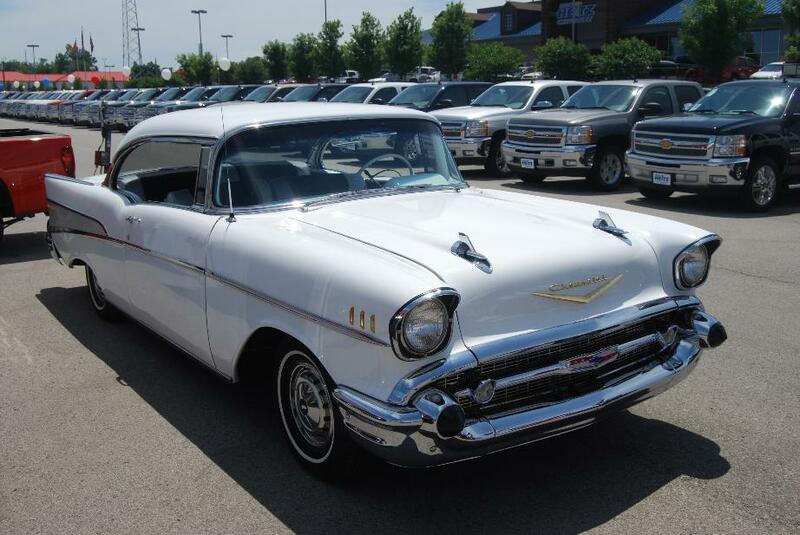 The Big Girl has been an entrant in numerous car shows and show-and-shines. She never won anything, but she evoked many "oohs" and "ahhs." Several years ago, the Big Girl came in 3rd or 4th in the Canadian River Cruisers' longest car/truck contest (even in all her longness, she still looked short next to the winning black Buick of Jim and Carol Hoffman). In 2012, the Big Girl ferried the Easter Bunny (played by Barry Tramel, Sports Journalist for the Oklahoman Newspaper) through his neighborhood and to his local park where all the children and parents were having an Easter party. 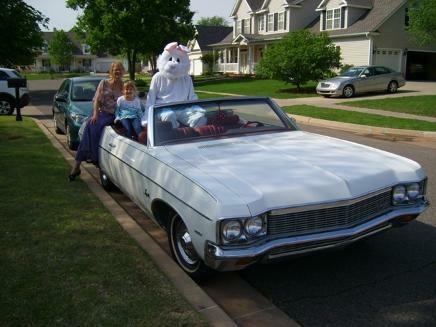 A six foot tall, furry, white Easter bunny sitting on the parade sash of a 20 foot long white Impala convertible was a sight to behold. The Big Girl's two greatest career honors came in 2011 and 2013. 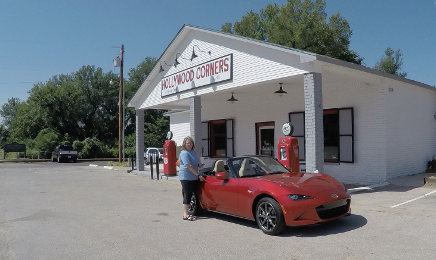 In October, 2011, she was selected to be the monthly Dig My Ride car in the Norman Transcript's classic car column, written by Doug Hill. In 2013, the Big Girl was one of the many featured classic cars in Ann Sherman's book, "Car Collections of Oklahoma: Timeless Automobiles and the Obsessed Oklahomans Who Collect Them." Now, the 1970 Chevy Impala convertible (formerly known as the Big Girl), will live in Oklahoma City. But, she will continue, in her sassy and classy way, to turn heads and collect more career highlights. Benito and his wife and children will have her unveiling at a large, community Easter party, to be attended by the families of many classic car lovers. Lani and Jon are invited to join the festivities. Lani will drive them there, in their Easter finest, in Topaz, the robin's egg blue 1967 Ford Galaxie. The newest member of the Lani and Jon fleet now has lots of space for parking. The Big Girl once occupied this spot. Went to Crest Grocery cars and coffee, with the intention of reporting on all the Valentine's Day red cars that showed up (thus the pic of the really red Lambo). It was a very warm day, so the Crest parking lot was packed with beautiful cars that were all shined up and ready to show. Ultimately, there were too many interesting cars to be constrained by the color red. So, here are my pics of the most interesting and unusual cars at the February Crest show. Best paint job goes to the Wicked Witch painted hood scoop of a green Challenger. Next, what are the odds that our very own cRc Plymouth Superbird owner -- Shannon would show up and have competition from two other Superbirds in green and blue. You know it is a great car show day in Norman when there are three Plymouth Superbirds. And for my personal pick of "OMG, what a car!!! How did they do that." We have the most phenomenal Oldsmobile lowrider done by Customs by Carlos. Its two tone green sparklelicious paint job was surpassed by an amazing altering of the car's suspension system. Very interesting suspension. I bet that aligning the tires is a real trick! And last, but not least the pink/purple lowrider Lincoln was classy, sparkly, huge, and about two inches off the ground. gIrly gEarhead Kaye dresses for our "boot scootin' event at Midway. Now Kaye is just showing off!!!!!!! We just said that Carol was from Wyoming in her "not exactly" cowgirl duds, but she did have a hat and boots! gIrly gEarheads Marilyn and Lani are caught discussing the proper way to adjust a 4 bbl Holley carb....? Sure they are. Lani continues to provide us with an insight into cars and bikes in Germany and nearby countries. This will be their final blog entry for this trip. I bring you photos of uniquely designed, classic European automobiles and motorcycles. These vehicles were on display in the Modern Museum of Art in Munich. They were part of an exhibit on modernistic, futuristic designed consumer products - consumer products which had designs that were "out there." Next I found a 1955/1956 Derny Taon 125, manufactured by Derny Motors, France. a front-engine, front-wheel-drive executive car manufactured and marketed by the Citroën from 1955 to 1975 in sedan, wagon/estate and convertible body configurations. Italian sculptor and industrial designer Flaminio Bertoni and Paul Magès developed the hydropneumatic self-levelling suspension. Noted for its aerodynamic, futuristic body design and innovative technology, the DS set new standards in ride quality, handling, and braking—and was the first production car equipped with disc brakes. 1937 Tatra - built in old Czechoslovakia (now the Czech Republic). Jay Leno has a 1938 model of this car in his garage. It was powered by a rear-mounted 3.0-litre air-cooled 90-degree overhead cam V8 engine that produced 85 horsepower and could drive the car at nearly 100 mph (160 km/h). It is ranked among the fastest production cars of its time. Today, I thought I would show you interesting sights (somewhat different from your standard travel pics) from Bavaria, in Munich, Germany. Munich has one of the largest glockenspiel (tower clock with moving parts). What is Germany without an accordionist dressed in Bavarian Christmas finest and dancing atop a little table! Even Bavarian dogs need a down coat to keep warm. Bavarian sausage hut at Christmas market. This Alpine mountaineering backpack, with a jet force (instant) inflatable, helps protect climbers in case of avalanche, by creating a space to the surface for the climber to get oxygen (cost is about 1100 Euro, but priceless if the climber gets caught in an avalanche). This page is dedicated to the cRc "gIrly gEarheads"............they have some of the finest cars in the club. Cali hopes Grandpa takes VERY GOOD CARE of this Falcon! 1941 she became one of the first women pilots of the Air Transport Auxiliary (ATA), to deliver several hundred Spitfires, Hurricanes, Mustangs, Tempests and other high performance fighter aircraft, and twin-engined aircraft and delivered Whitleys, Blenheims, Mosquitos, Mitchells and Wellingtons, flying solo when doing so. She continued intensive flying with the ATA until the in late 1945. By that time she had flown 80 types of aircraft and had delivered 260 Spitfires. A time to revisit this page as new items from the web are being posted all the time. We dedicate this page to our many "gIrly gEarheads" in the cRc......women who can overhaul the inside of a carb of set the timing. We appreciate your being a vital part of the club. This feature is about an amazing lady - A young lady with the unlikely stage name of Aloha Wanderwell, was Idris Hall in real life. Or was she Aloha Wanderwell in her heart. Go to the link that we provide below, and explore the interesting life that this girly gEarhead enjoyed.